A little about onyx before we delve into the value of black onyx. Onyx is a variety of chalcedony, which has bands of white and other colors. 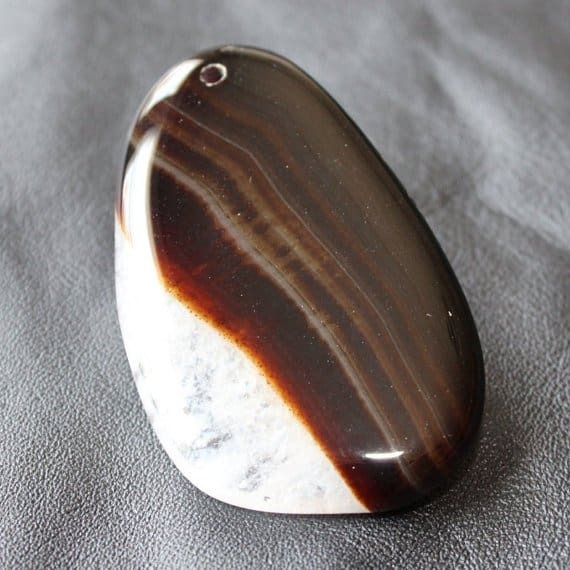 Agate and onyx are similar in that they have bands of white in them. Agate has curved bands while onyx has parallel bands. Black onyx often has stripes of white and black with black being more dominant. Onyx comes in a variety of colors like red, yellow or blue. It falls under the category of quartz stones, and has a hardness of between 6 and 7 on the Mohs hardness scale. Most of the black onyx seen in jewelry doesn’t have the white stripe, so some people are not even aware that black onyx has another color to it unless it’s been used for a cameo. 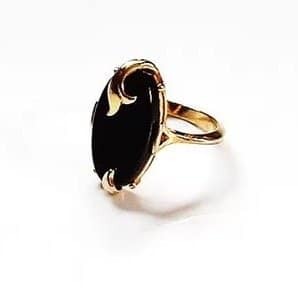 Throughout history, onyx was used in a variety of jewelry pieces, especially cameos, where the carving was in one color and the background was the next layer of color. 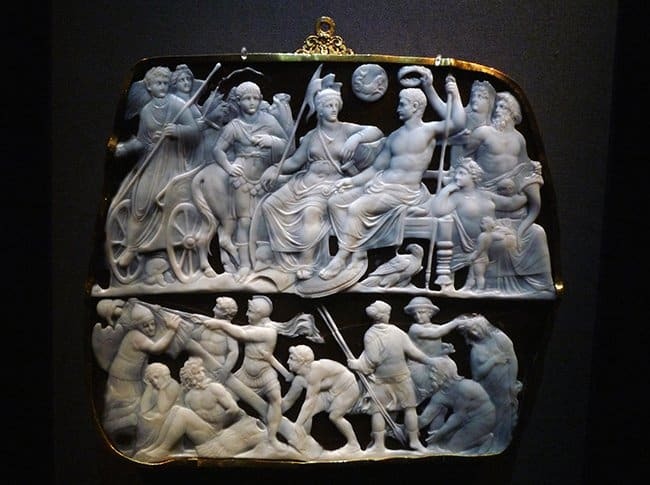 There are some famous cameo carvings like the Gemma Augustea, which was produced sometime between the years of 9 and 12 AD. Black onyx that isn’t made into cameos to feature its beautiful layering are dyed to give them a uniform color. It’s possible to dye the stones because onyx is porous like other stones in the chalcedony category. Many black onyx stones are dyed today while others are treated with heat and polished to a silky sheen. Where is Black Onyx Found? The stone is found in a variety of places from Yemen to Uruguay to Germany and India. There are a few onyx mines in Arizona like Prescott, Ash Fork and Mayer. Here is one of the largest Onyx mines in the country of Pakistan. Hard work, but worth it to get to all of that beautiful onyx! 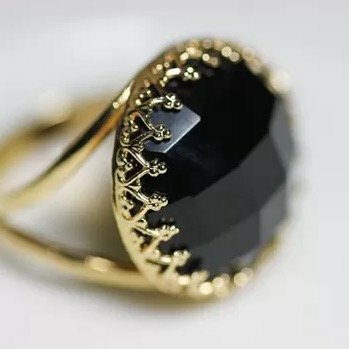 While some people through history used black onyx for mourning since it’s so dark, it actually is thought to also smother negative emotions from exterior forces. It’s used as a powerful charm of self-protection for that reason. The Greek word onyx means the nail of a claw or finger, and the Greek legend is that one day while Venus was asleep, Cupid cut her fingernails. They fell to the ground, but because no part of a god can die, they became known as onyx. According to the ancient Italian and Hebrew calendar, the onyx is the birthstone of July. The ancient Tibetan calendar assigned onyx to December as a birthstone. Old astrologers thought the stones would give people power and courage, so they assigned the onyx to Leo and Capricorn, which were though to be the two most ambitious signs according to the Zodiac. A person wearing black onyx is thought to be edgy and dark with strong personalities. While it was commonly worn by people who were mourning throughout history, it’s now worn by a variety of people from goths or emos who identify with the stone because of its color to fashion-conscious women who want a stone that will match with any outfit. The affordability of onyx stones means that it can be turned into beads for necklaces and bracelets or used as large stones in rings. After all this discussion regarding the history and uses for black onyx, it’s time to talk about the value. The value depends on whether it’s been treated or remained natural. While it won’t go down in price too much when treated, there is a slight decrease in price. If it’s been turned into a piece of jewelry already, you’re going to pay more for the jewelry than you would for individual beads, jewelry pieces or individual stones. The price will go up depending on a few factors like the cut and size of the stone. The value will also depend on the craftsmanship of the piece of finished jewelry itself. The black onyx is more valuable than the other colors of onyx available, too. Black onyx can vary in value from $1 to $500 per carat on its own. That varies with the setting of the gemstone itself. With a setting of silver, it’ll be less than a setting of yellow or white gold. More elaborate stone shapes like the marquise cut or the heart cut will often be more expensive than the round or oval cut. When added to a simple ring, a halo of diamonds can create an amazing centerpiece that can bring the expense of the jewelry a bit higher, but it can be an incredibly stunning ring choice for those who love something a bit out of the ordinary. 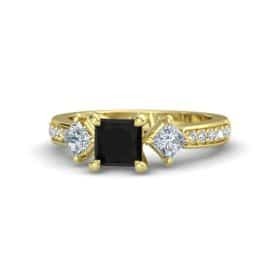 While black onyx is not as rare as a red diamond, it’s a fantastic way to get an original, unique ring that truly speaks to your personality. Finding a way to be memorable and unique in this world can be difficult unless you’re willing to step away from the normal and basic.